There are so many amazing discoveries of 2013 and this is one of them. Honestly, this is what I considered as the most amazing of them all knowing that it is unbelievable even up to the point that it has been forecasted in the news in the county of Nepal. 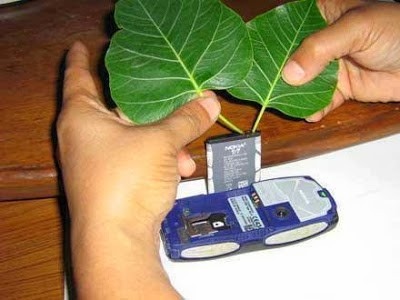 You are going to witness this possibility of having your mobile phone charged with the use of peepal leaves which can be found in the forests of Nepal. The scientific name of the said leaves is Ficus religiosa. We have problems with our mobile phones especially in terms of very weak battery. Now, with the use of this leaf by following the process that I am going to tell you later, you will be able to conserve electricity and bring your mobile phone back to life again. Here is the procedure in doing such. Mind you, this is still under observation and subject to studies but you might want to consider this. 8. If required repeat the process with fresh leaves. Follow the instruction right and you will get the best results.